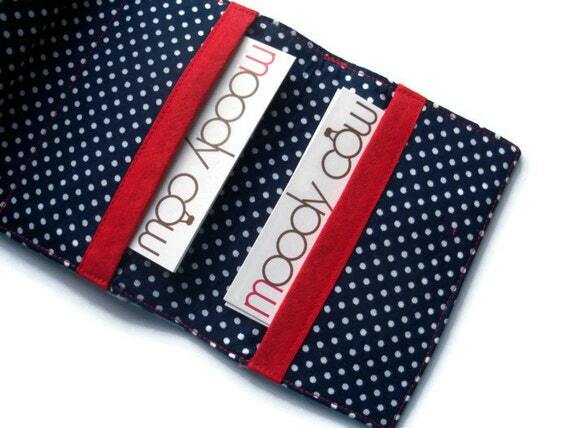 There are 2 pockets to hold business cards, bank cards and even gift cards. Each pocket has been edged in red bias binding. Have added some interlining to give the holder some body. The business card wallet has also been top-stitched all round the outside edge in red thread. It closes with a red elasticated loop with has been securely attached to the back of the case so it will not get lost when you open the card wallet. Folksy :: Buy "Card Wallet / Holder"
Folksy :: Buy "Fabric Card Wallet / Holder - Hearts"
Folksy :: Buy "Fabric Card Wallet / Holder - Polka Blue"
Folksy :: Buy "Fabric Card Wallet / Holder - Denim"
Folksy :: Buy "Fabric Card Wallet / Holder - Circles"